I had the pleasure (and laughs) of watching my granddaughter, Ruby, play in a soccer game on her sixth birthday. 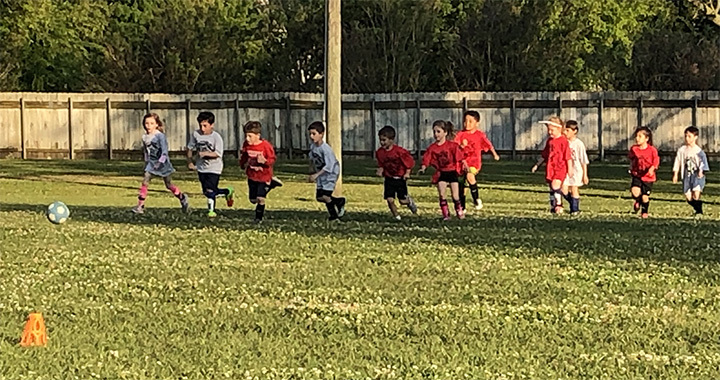 Understand that what five and six-year-olds know about playing soccer is pretty limited. Their grasp of the sport is pretty much limited to 1) they must get the ball into their goal and 2) stop the other team from getting the ball into their goal and 3) lots of kicking the ball is involved. Beyond that, all bets are off—to everyone’s amusement. The two teams were unbalanced. Ruby’s team (with the red shirts) had only six players while the silver shirts team had eight. That didn’t matter much because, by the time we left, the red shirts were leading four to zip. 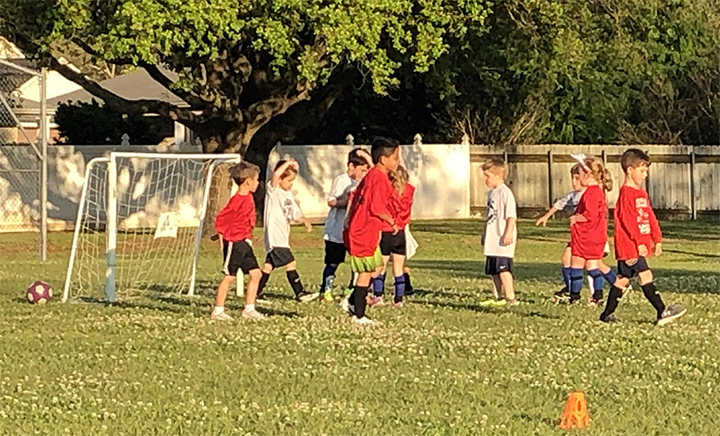 There isn’t much team strategy in soccer at this age level. Both teams kind of gravitate around the moving ball like a leaderless herd with most not really doing much beyond following said herd up and down the field—and often off the field. Way off the field, as seen in this pic. Ruby, the birthday girl complete with her birthday crown as seen in the pics, seemed more content to just kick over the boundary markers. Her heart wasn’t in this. She was likely more interested in getting back to her cake and ice cream.